12 of the best Pro-Ject turntables of all time | What Hi-Fi? Pro-Ject Audio Systems has been one of our go-to names when it comes to record players for longer than we care to remember. The company, founded in Austria back in 1991, really hit the ground running, bagging five-star reviews with some of its very first turntables. Majoring on minimally-designed, simply-specified decks that concern themselves primarily with delivering great sound on a budget has, perhaps unsurprisingly, proved a record for continued success. The Pro-Ject 1 laid the foundations for what has been a virtually unblemished record of success. This deck was essentially a modified version of the Tesla NC-500, originally made as an affordable turntable for distribution across Central and Eastern Europe. The original Pro-Ject 6 took home the What Hi-Fi? Best Turntable Award back in 1993, beating the legendary Systemdek IIX/900 that had taken home that accolade for the four years previous. So it was good, but this version was even better. This upgrade arrived in 1996 and came with the addition of a Sumiko tonearm and Ortofon MC25 FL cartridge, bumping the price from £450 to £850. That's around £1500 in today's money for what was actually the least expensive cartridge option on offer. "If you're looking for a turntable to grip you intensely, your search stops here," is how we put it in our original review, which sounds pretty good to us. Clearly the Debut wasn't the first product to come from Pro-Ject but, it was certainly one of the most significant. Simple to use and great value for money, it set the tone for a whole host of products that would follow it. £109 back in 1999 was a veritable bargain, and in fact came at a time when we were seeing fewer and fewer record players. There was no speed change and you had to lift the platter and fiddle with the belt, but there was no arguing with the sound. 20 years of steady improvements have led to the Debut Carbon (see below) but it's with this original that Pro-Ject really came to the fore. Proving Pro-Ject was more than just entry-level offerings, the Perspective was a £1000 deck that looked and sounded like a £1000 deck (that's more like £1700 in today's money). The styling would catch your eye with that transparent base, but it was the fine sound and easy set-up that sealed the deal. "Phenomenal value", is how we heralded this spinner, which says it all at this sort of money. A smooth but full-bodied sound, helped by a solid Ortofon cartridge, made for another five-star Pro-Ject record player. Back at the turn of the century, turntables had to make do with a cursory mention in the Accessories section of our Awards issue. Our pick for the year 2000 was this simple and straightforward set-up from Pro-Ject. It produced a “rich and detailed soundstage” and good dynamics. Combining the turntable above with the phono stage Award winner, Pro-Ject's very own Phono Box, made this a great one-box solution for anyone looking to take their first step on the vinyl ladder. "Another year, and another budget Award winner for Pro-Ject" was an apt opening to the Genie's entry in our 2007 Awards issue. The Genie slipped in underneath the Debut as the new entry-level model, costing only £125. Again, it was basic with a minimalist design and a fitted arm and cartridge. There was an outboard motor, though, isolating the power from the platter – a technique normally reserved for high-end decks. The Genie delivered a clean, transparent sound, and a solid upgrade on previous Debut models. Magic. The Xtension was another attempt by Pro-Ject to show the world that it was a great turntable manufacturer at all price levels, not just budget. And it worked. Finished in a smart wood veneer, and also available in Apple, Cherry and Black Gloss, it cost £3000, though you'd need to add an extra thousand pounds or so for the recommended tonearm and the same again for the cartridge. Interestingly this premium player supported 78rpm records, though you had to get hands-on with the belt – 33 1/3 and 45rpm was a flick of a switch – and there was a detachable headshell for switching out cartridges. Most importantly, this Pro-ject had a fluid, easy going, enticing sound. It's a turntable that puts listenability ahead of outright analysis and, like any great product, will have you reaching for all your favourite records just to enjoy them afresh. A high-end Pro-Ject success. The Debut Carbon picked up the Award-winning baton from the original Debut, using an unusual carbon fibre for a super light, super strong design. A metal platter added to the heft and there was an Ortofon 2M Red cartridge. It's another fairly hands-on design, requiring set-up of the counter weight and bias, and a manual movement of the belt if you want to change the speed. Maybe the seven high gloss colours were designed to take your mind off that. Run close come Awards time by the Rega RP1 of the day, it delivered a clean, insightful sound that revealed plenty of texture and had a good way with rhythms. It proved once more that the Pro-Ject Debut range, in all its incarnations, could do very little wrong. 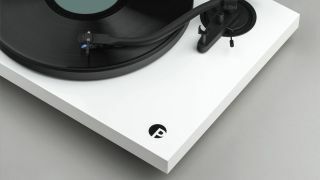 The Elemental is the current entry-level Pro-Ject turntable and a suitably impressive example of the form. And that makes it a fine first step on the vinyl ladder. It really is plug and play, with just about everything attached and adjusted, and only the belt needing some attention – you need to fix it manually and then move it yourself if you want to change the speed. While this record player isn’t going to knock you off your chair, we think it's a strong enough all-rounder to deliver fine performance with the kit it's likely to find as a partner. More than 25 years on, Pro-Ject still delivers the goods for anyone after an affordable record player. The Juke Box E is one of those ideas that is simple and obvious, once someone else has had it. And for all the excellent budget turntables that have graced our pages, and indeed this page, it shows the company is more than capable of innovating. This deck is based on the excellent Primary turntable, but adds an Ortofon OM 5E cartridge, amplification, and a Bluetooth receiver. A selection of outputs and inputs make this more of an all-in-one system than a mere turntable. And it's an all-in-one system that demands very few compromises, given its price, and makes a strong argument against the need for separates. So if space is at a premium or funds are tight, you should cast your glance in this direction. What's more, it shows Pro-Ject is, and has always been, far more than 'just' a brand responsible for brilliant budget turntables.